The South Korean giant had recently launched Samsung Galaxy J3 V handset in the U.S. and priced at $168 (approx. Rs. 11268). 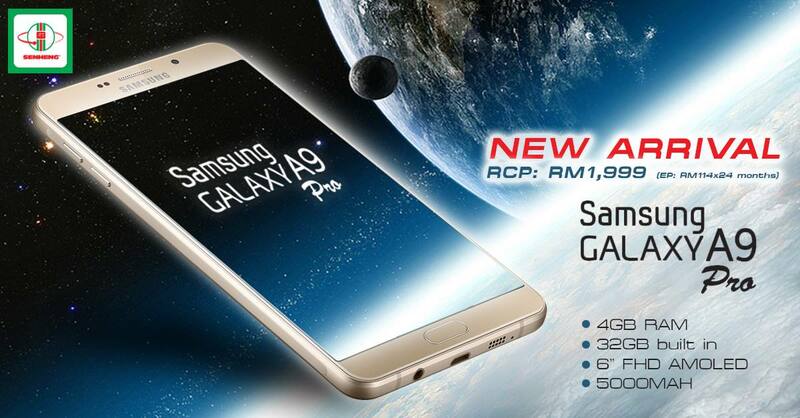 Now, the company has announced the international variant of Samsung’s Galaxy A9 Pro smartphone in Malaysia. Earlier, it was listed on GFX Benchmark & TEENA database. After that, it was launched in China with the price tag of 3,499 Yuan (approx. $540 / Rs. 35,800). Though, the device is not listed on their official Malaysia website yet. The device flaunts a 6.0-inch Super AMOLED screen with FHD (1920 x 1080 pixel) resolution that offers a 367ppi of pixel density which gives excellent viewing angles to your device. Under the hood, it comes equipped with a Qualcomm Snapdragon 652 Octa-core processor clocks at 1.8 GHz paired with Adreno 510 GPU. It runs on the customized TouchWiz UI based on Android 6.0.1 Marshmallow overlaid. The handset supports dual SIM dual standby and offers 4G LTE network. Connectivity options on the device include Wi-Fi, Bluetooth, MicroUSB, FM Radio and A-GPS. It houses a 32GB internal storage which will further expandable up to 128GB based on microSD card slot and enhanced 4GB of RAM compared to 3GB RAM on Galaxy A9 handset. The device comes with a fingerprint sensor, which is embedded with a physical home button on the front. The device comes powered by a massive 5000mAh battery, which can give the battery life more than a day of usage. As per as cameras are concerned, it bears 16-megapixel autofocus rear camera with LED flash, which is the enhanced version of the Galaxy A9. It can also record videos up to 1080p at 30 frames per second. In the front, it has an 8-megapixel secondary camera for selfie shots. The handset will be available in Pink, Rose Gold, and White color variants. Now, the device is available for purchase in Malaysia and priced at RM 1,999 (approx. Rs. 33548 / $496). It also providing exclusive benefit offers to you like 0% IPP up to 36 months and one year warranty.